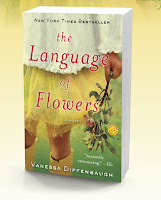 World Book Night is a week from tomorrow, and a couple of days ago I finished reading The Language of Flowers by Vanessa Diffenbaugh, the book I'll be giving. I chose this book on the recommendation of a family member. As it turns out, the protagonist, Victoria, is a young woman in her late teens who has just left the foster care system. We follow two story lines in alternating chapters, one about Victoria's childhood involvement with Elizabeth, the foster mother who teaches her the language of flowers, and the second about her experience as she tries (or I should say, is almost forced) to make a life for herself. The young character makes this a book of particular interest to me, because I like to ponder the differences between a children's/YA book with a child/YA character and an adult book with a child/YA character. Diffenbaugh also does a good job showing why Victoria is filled with anger and does ugly things. In lots of books with characters like that the behavior is just there without enough development to make what they're doing make sense. Readers are expected to accept it and move on with the story. What readers of this blog might find particularly interesting about this book is that while it's an adult book, I thought it seemed very much like a YA problem novel--a teenager, usually a girl, has a specific problem that, after much struggle, she overcomes. If you removed the Victorian language of flowers from The Language of Flowers, I think it would have seemed even more like a bare bones YA problem novel. I think this is a novel that could end up on library book lists for teenagers, just as I thought Alice Bliss would.